People often ask me “What is it like to fly in a hot air balloon?” After 25 years of doing just that, it is just as challenging and gratifying for me to describe as ever. At various times, I’ve described the hot air ballooning experience as being as close to flying on a magic carpet as one can likely get. Maybe a flying balcony might be a better description, since balconies have railings! 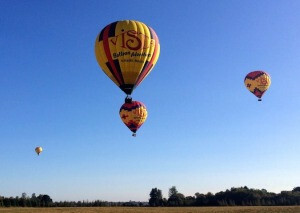 Flying a hot air balloon is a mix of science and art: the science is what pilot training is all about, while the magic is something we feel during every flight. Balloons fly in ways no other aircraft are capable of, resulting in an absolutely unique experience: skimming the treetops with a hawk watching the balloon float by, while at other times just barely touching the surface of the Willamette River – just enough to make a ripple while sailing downstream (or upstream, for that matter). Ten minutes later, you might be 3,000 feet high, looking at ten snow-covered peaks of the Cascades: Mount Rainier and Mount Hood to Mount Jefferson and others in between. A balloon pilot learns that there is a ‘list’ of nearly magical experiences possible with Lighter-than-Air flight: the objective is to craft the flight in such a way as to show off as many of them as possible in a single flight. For many passengers, their flight will be on their bucket list, others will celebrate a special occasion such as a birthday, anniversary, engagement, or received a gift certificate for any one of those events. Others fly “just because” – and they will do it again and again. 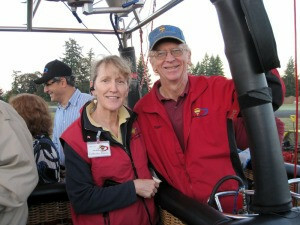 Roger Anderson founded Vista Balloon Adventures 25 years ago with his wife Catherine Driver. Roger, as the Chief Pilot for Vista, can always be found in the air piloting a Vista Balloon Adventures hot air balloon on a beautiful flight day from April through October.